Our data-driven adaptive platform delivers dynamic, ongoing remediation and personalized mastery to every student in every concept like none other. Watch how we transform learning by delivering dynamic, ongoing remediation to every student. Here's answers to most frequently asked questions that help you choose the right solution. How exactly will ScootPad help Students? Over 75% of classrooms have students with knowledge gaps that span across multiple grade levels. Teachers simply don't have the time, patience and data to fill these knowledge gaps for each and every student on a daily basis. ScootPad meets every student exactly where he/she is in every concept, ensuring they receive the right level of practice, instruction, remediation and assessment - this happens in real-time and automatically. ScootPad auto-detects knowledge gaps in real-time and scaffolds to prerequisite skills (at or below grade level) when necessary to help each student catch up on exactly what they need to move ahead. As a result, students continuously receive the right level of support at exactly the right time to overcome all learning gaps and master every concept in their path. To learn more about how ScootPad helps students, please visit our how ScootPad works page. How exactly will ScootPad help Teachers? Over 75% of classrooms have students with knowledge gaps that span across multiple grade levels. Yet, most teachers have resources and knowledge to address only one grade level. Teachers simply can't muster the time, patience, data, and recall needed to offer the level of support needed to each and every student on a daily basis. That’s why, at ScootPad, we built a powerful data-driven platform to deliver personalized remediation and instruction to help each and every student move ahead and reach their full potential. As a result, students continuously receive the right level of support at exactly the right time to overcome all learning gaps and master every concept in their path. Teachers gain powerful insights and data that enable them to teach smarter, not harder! 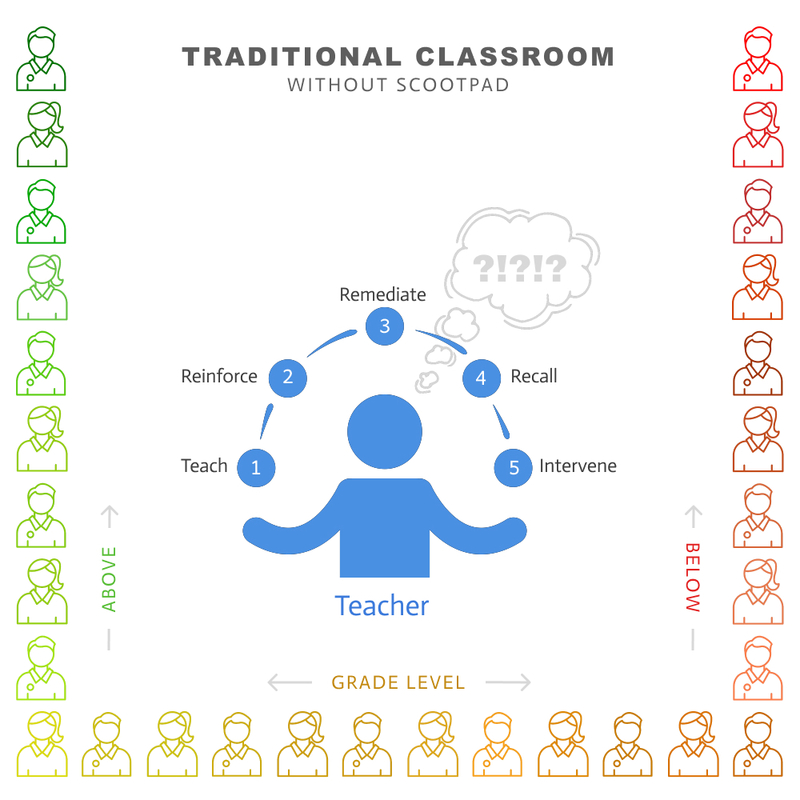 ScootPad offers teachers a smarter way to predict which concepts need re-teaching and which students need intervention. As a result, teachers save valuable time that they can use to focus on more important tasks such as what to teach, when to intervene and which students to rescue from failing. To learn more about how ScootPad helps teachers, please visit our how ScootPad works page. 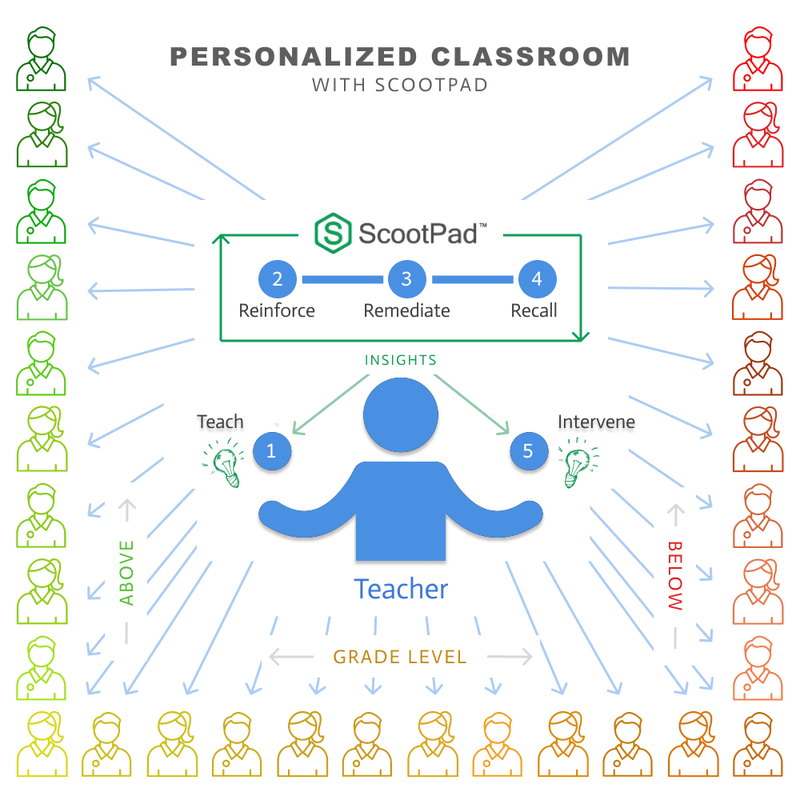 How exactly will ScootPad deliver Personalized Learning? Traditionally, products claiming personalized learning capabilities identify a student's level of proficiency in a subject matter only at a single point in time and only by using a fixed number of questions (with a diagnostic test, knowledge check, quiz, assessment etc.). Then, it will seek to develop a curriculum to fill the identified gaps of knowledge. In such single-point adaptive solutions, the curriculum remains static and ignores students' ongoing progress and struggles. ScootPad, however, enables continuous adaptivity to meet each student's unique needs in real-time. ScootPad analyzes each student response in real-time taking into account their latest proficiency and will adjust the rigor (number of questions to practice and their respective depth of knowledge) and adjust the learning path (the next concept to learn). In other words, ScootPad's adaptive learning process is dynamic and thereby continuously adapting to each student's unique needs and adjusting the learning path in real-time to achieve mastery in the desired concepts. Personalized learning on ScootPad is made possible by the combined power of data-driven insights and mastery-based spiral learning techniques. As a result, students receive learning that is continuously personalized with the right level of remediation at exactly the right time to overcome all learning gaps and to enable mastery in every concept. To learn more about ScootPad's mastery-based spiral learning approach, please visit our how ScootPad works page. Do teachers have flexibility in how they can use ScootPad? Mastery-Based Classrooms: One or more teachers teach to groups of students based on their specific needs. Teachers leverage our pre-built learning paths and also design their own custom learning paths. Traditional Classrooms: One teacher per classroom. Instruction is defined by curriculum maps and pacing guides. Teachers design their own custom learning paths and add to them as they progress during the school year. Technology-Infused Classrooms: Students use ScootPad in a lab setting driven by a secondary teacher. Instruction is assumed by the primary teacher (who may or may not be using ScootPad). Our pre-built learning paths are used in this scenario. After-School Classrooms: Students use ScootPad in an after-school setting driven by a secondary teacher who may or may not be the primary teacher providing the student with direct instruction. Our pre-built learning paths are used in this scenario. To learn more about ScootPad's student-centered learning solutions, please visit our ScootPad Learning Solutions page. Is ScootPad research based? What evidence of efficacy is available? Designed to maximize learning outcomes, our platform is powered by research-backed strategies from cognitive science, learning science and data science to create powerful personalized learning experiences for every student. Our reseach team is led by distinguished professors and renowned researchers from Stanford University. To learn more about ScootPad's research-backed platform, please visit our platform overview page. Over 600 schools trust ScootPad to power their student learning. ScootPad partners with schools to develop and implement controlled case studies to measure effectiviness of their ScootPad implementation and it's impact on student outcomes. Schools that follow our best practices driven implementation fidelity have shown a significant increase in student engagement and double-digit growth in test scores. To read these case studies in detail, please visit our Case Studies page. What training is available to help teachers achieve success with ScootPad? ScootPad offers a comprehensive set of free PD opportunities including on-demand video-based training and live virtual sessions for teachers and administrators. Our ready-made training programs are designed for three types of users: 1) novice teachers to help them get a successful start 2) teachers who need more in-depth training in advanced implementation models and 3) instructional coaches and mentors who need to know everything about ScootPad to support their teachers. In addition to these pre-built training options, ScootPad works with each school to develop a personalized training plan and a quarterly best-practices review process to ensure their implementation of ScootPad is both successful and effective. To learn more about ScootPad's training and PD offerings, please visit our training center page. Here's 10 reasons why ScootPad is the world's most personalized mastery platform. Engaging video based instruction content with interactive tech-enhanced practice and assessment items. Static text based instruction content with traditional multiple-choice practice and assessment items. Flexible curriculum with customizable learning paths tailored to your instructional models, pacing guides and grade-level objectives. Curriculum is pre-defined and fixed with alignment to one grade level. Each student has their own learning path which takes into consideration what they already know and adjusts in real-time to meet their unique strengths and needs. All students follow the same learning path ignoring what they already know and not addressing their unique strengths and needs. Knowledge gaps are automatically detected and filled in real-time, both at and below grade-level, helping each student catch up on exactly what they need to move ahead. Teachers are expected to review data and deliver differentiation and remediation to each student manually. Real-time remediation and predictable outcomes help teachers proactively adjust their instruction to prevent interventions before it's too late. Interventions are identified after students hit a wall with their learning and that is often too late for teachers to help. Spiral practice through research-backed retrieval, interleaving and spacing leads to deep, long-lasting conceptual learning. Massed practice of one concept at a time leads to surface-level short-term memorization and an illusion of mastery. Teachers can easily gauge student knowledge and measure longitudinal growth with pre-built tech-enhanced items and standards-aligned assessments. Teachers often rely on worksheets and assignment data to gain formative insights and lack tools to measure effectiveness and student growth. Students are continuously engaged with collaborative game-like features to instill intrinsic motivation, growth mindset and self-determination. Teachers are expected to manually and continuously administer student engagement and motivation strategies to keep students focused. Intuitive UX. 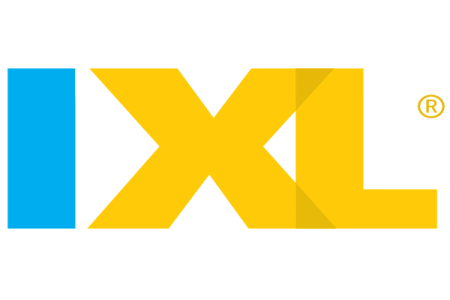 Any Device 24x7. Modern and responsive UI design to deliver rich and intuitive user experience on any device. Accessible anytime and anywhere on all click and touch devices. Static UI. Limited Access & Compatibility. Traditional learning tools are Web 1.0 designed with a rigid user interface that is compatible with limited types of devices and only on-site. All Inclusive & Super Affordable. Very affordable and all-inclusive pricing which covers the license, onboarding, ongoing reviews, free training and unmetered support. Typically expensive due to the costs associated with the license, implemention, training and ongoing support. Select a product (by clicking the product logo) on the left to compare it with ScootPad. Pre-built curriculum and tech-enhanced content to support Common Core, US State Standards and International Standards. Design custom learning paths aligned to your own instructional models, pacing guides or curriculum guides. Auto-adjust learning paths in real-time to each individual students' unique strengths and needs in the moment. Auto-detect knowledge gaps, scaffold instruction and fill prerequisite skill gaps, at or below grade-level. Actionable insights for teachers to predict interventions, adjust instruction, implement interventions and monitor improvement. Ensure deeper and long term learning using research-backed strategies (dual coding, mastery, interleaving, retrieval and spacing). Author custom items or assign pre-built assessments to gauge student knowledge and measure longitudinal student growth. Engaging and collaborative game-like environment to drive intrinsic motivation, growth mindset and self-determination. All features are accessible to all users anytime and anywhere via Chromebooks, desktops (click) and mobile (touch) devices. Competitive and affordable pricing for licenses and teacher training to achieve sustainable results year after year. P.S. This product comparison page is merely a tool to help you compare ScootPad side-by-side with other products. Review each capability carefully and if you disagree with our assessment, simply click or to change it. Once done, you can print this page for your records. Disclaimer: This information does not constitute any contractual representation or warranty either expressed or implied. All liability for any errors, omissions, incidental, special or consequential loss is expressly disclaimed. All copyrights, trademarks and trade names shown above are properties of their respective owners. This product comparison page is merely a tool to help you compare ScootPad side-by-side with other products. Review each capability carefully and if you disagree with our assessment, simply click or to change it. Once done, you can print this page for your records.